It’s quite interesting to learn how various solemnities and feast days are celebrated in the Catholic Church around the world, in particular those days that we call Holy Days of Obligation, some of which are moveable feasts, that is, the date changes (Easter, for example), whereas some feasts retain the date year after year (All Saints, November 1, Christmas December 25, etc.). Honolulu Bishop Larry Silva told me the diocese does have only two holy days of obligation for the reasons cited. The Presbyteral Council recently discussed this and decided to leave things as they are, but special Masses will be offered on the days the rest of the U.S. celebrates as holy days of obligation. A memo was sent to all parishes to remind the pastors of the importance of celebrating these days and making Masses available at convenient times. I’ve not done a study on this but I am sure that the holy days of obligation might be celebrated in different ways around the world, according to individual Episcopal conferences, as we have seen with the USCCB. November 1, the feast of All Saints and November 2, All Souls Day are important days for Christians, and for Catholics in particular, especially November 1 as it is a precept of the Church, that is, obligatory Mass attendance. Halloween, of course, has become the big thing in many cultures now, including Italy even though the word Halloween derives from All Hallows Eve, referring to celebrations of the hallowed or holy, that is, the saints, on the day before their feast day, November 1. Orange and black are the colors here, as they are in the U.S., restaurants offer special menus and are decorated for this seasonal day, and the occasional child can be seen in a costume, although the really big day of the year for children and costumes is Mardi Gras, just before Lent. It is tradition at the Vatican for Popes on November 1 to celebrate Mass for the Solemnity of All Saint’s at the Campo Verano cemetery in Rome and, on the following day, November 2, to lead a prayer service in the Vatican Grottoes for all deceased Popes. Both days are holidays as well as holy days for Vatican employees. This year, however, a bit of a change for the Holy Father. Pope Francis will pay homage to war victims during a visit to the American military cemetery in Nettuno, south of Rome, on All Souls Day, November 2. There, at 3:15 in the afternoon, he will celebrate Mass for all war dead, marking the annual Catholic tradition of mourning the departed. This is a new departure for Pope Francis, who normally says Mass for All Souls’ in Roman cemeteries. Later that afternoon the pontiff will visit the Fosse Ardeatine to pray for the 335 victims killed on the site by the then occupying Nazi forces in March 1944. The mass killing was in retaliation to a partisan attack on a column of marching German policemen on Via Rasella, near Piazza Barberini in central Rome – 10 Italians were to be killed for every one German solder killed. Subsequent to the massacre,, the Ardeatine Caves site (Fosse Ardeatine) was declared a Memorial Cemetery and National Monument open daily to visitors. Every year, on the anniversary of the slaughter, a solemn State commemoration is held at the monument in honor of the fallen. November 1 is such an important day for Italians that newspapers – the paper variety and online – publish special inserts on how to get to a city’s cemeteries, where to park cars, what shuttle buses are available within cemeteries, etc. Cemetery opening hours are usually longer in the October 29 to November 5 period and they are posted online and at the cemeteries, etc. Also published are the hours and routes of the “C” busses (“C” for ‘cimitero’ or cemetery). In Rome there are 12 cemeteries and each one has special rules and regulations and opening hours. The larger ones will also have free shuttles buses (because no cars will be allowed) to take people to the graves of loved ones. In Rome’s largest cemetery, Verano, 16 stops have been programmed for these buses. An estimated 1 million people are expected to visit Rome’s cemeteries in the weeklong period dedicated to the deceased. The city always make a concerted effort at this time of year to clean cemeteries of trash, to repair walkways and even headstones and to do some serious gardening. Visitors too will clean tombs, bring fresh flowers and entire families will meet to mourn their dearly departed as well as to celebrate their lives. Family members then usually go out for lunch or dinner, sometimes even taking a picnic lunch along (though not for eating in the cemeteries – even though that is what the very first Christians did when they gathered at burial grounds or in the catacombs). One Rome paper a few years back published a survey on the cost of funerals, saying “there is some meager consolation for those in mourning in the capital of Rome because a funeral there costs the least” of all cities questioned for the survey. I don’t have the figures for 2017 but in recent years average funeral costs ran about 6,000-8,000 Euros, with cremation costing between 3,000-4,000 Euros. These prices are supposed to include a walnut coffin with zinc interior (except for cremation, of course), flowers, the burial and documents. However, say newspapers, the best bargain is still a funeral paid for by the city, as they cost several thousand Euros less. The price of flowers soars for about a week every year during this season, but that does not stop Italians from buying in large quantities. And, as I learned the first year I was in Italy, chrysanthymums are the flower of choice for tombs, for the deceased! You do not bring these flowers to people when you go to their home for dinner nor do you – heaven forbid, as I learned the hard way! !– bring them to people in the hospitals. During the first three centuries of Christianity the Church frequently had to operate “underground” due to the persecutions of the Roman state against her. During these periods there were many martyrs who died for their faith in Jesus Christ. The most renowned of these were honored locally by the preservation of the relics (if available) and by the celebration of the anniversary of their death, as a feast in honor of their birth into eternal life. As time passed, neighboring dioceses would honor each others martyrs and even exchange relics for veneration, the way the first century Christians kept the clothes and handkerchiefs touched by St. Paul (Acts 19:12). Pope Francis dedicated the last three days to marking the solemnity of All Saints on November 1, the feast of All Souls yesterday, Sunday and celebrating the traditional annual Mass this morning in St. Peter’s Basilica for the deceased cardinals and bishops who died in the past year. A myriad of adjectives could be used to describe Francis’ words over these three days – beautiful, profound, moving, heartfelt – but Saturday’s homily at Verano cemetery stands out as it was not only powerful – it was unscripted! In his extemporaneous homily, Francis went on to say, “Among these are also those who are persecuted for their faith, those ‘robed in white’ in the passage from Revelation: ‘They are the ones who come from great distress, and their robes are made white by the blood of the Lamb’. And today, without exaggeration, today on the Feast of All Saints, I would like us to think of all these, the unknown saints. Sinners like us, worse off than us, destroyed. Of this multitude of people who are in great distress: most of the world is in distress. And the Lord sanctifies this people, sinners like us, but He sanctifies these people in distress”. ”Finally,” said the Holy Father, “there is a third image, ‘God. The first, the devastation; the second, the victims; the third, God. God:’ Beloved, we are God’s children now,’ we heard in the second reading: what we shall be has not yet been revealed. We do know that when it is revealed we shall be like him, for we shall see him as he is’, that is: hope. And this is the blessing of the Lord that we still have: hope. Hope He will have pity on His people, mercy on those who are in the great distress and compassion for the destroyers that they will convert. And so, the holiness of the Church goes on: with these people, with us, that we will see God as He is. And what should our attitude be if we want to be part of this multitude walking to the Father, in this world of devastation, in this world of war, in this world of distress? Our attitude, as we heard in the Gospel, is the attitude of the Beatitudes. That path alone will lead us to the encounter with God. That path alone will save us from destruction, from destroying the Earth, creation, morality, history, family, everything. That path alone. But it too will bring us through bad things. It will bring us trouble. ”God of infinite mercy, we entrust to Your immense goodness all those who have left this world for eternity, where you await all humanity, redeemed by the precious blood of Christ Your Son, who died to save us from our sins. “Look not Lord, at our poverty, misery and human weaknesses when we present ourselves before You to be judged in happiness or condemned. ”Gaze upon us with pity, born of Your tender heart and help us to walk the path of purification. May none of your children be lost to the eternal fires of hell, where repentance is no more. ”We entrust to You Lord, the souls of our beloved departed, of those who died without the comfort of the Sacraments or who did not have the opportunity to repent, not even at the end of their life. ”May no one fear the encounter with You at the end of their earthly pilgrimage, in the hope of being welcomed within the embrace of your infinite mercy. May sister death find us in prayerful vigilance, and full of all the good we have done during our existence, be it long or short. The synod on the family is over but talk about marriage and the family continues in the Vatican. in part as prelude to the October 2015 synod on the family, Part Two. In fact, from November 17 to 19, 2014 the Congregation for the Doctrine of the Faith will host a colloquium in Vatican City, in cooperation with the Pontifical Council for the Family, the Pontifical Council for Inter-religious Dialogue, and the Pontifical Council for Promoting Christian Unity, on the “Complementarity of Man and Woman in Marriage.” It is a global, inter-religious meeting featuring representatives from 14 religious traditions and 23 countries. Pope Francis will open the meeting. Sessions will be opened successively by the leadership of each of the cooperating Vatican offices, followed by the presentations and witness testimonies of leading religious figures and scholars. Each session will also premiere one of six short films treating men and women and marriage the world over. Each film features a variety of illuminating interviews with young and old, single and married, women and men, lay and religious, from many cultures, continents and religions. Topics range from the beauty of the union between the man and the woman, to the loss of confidence in marital permanence, to the cultural and economic woes that follow upon the disappearance of marriage. Go to http://www.humanum.it to see the trailer video mentioned above. 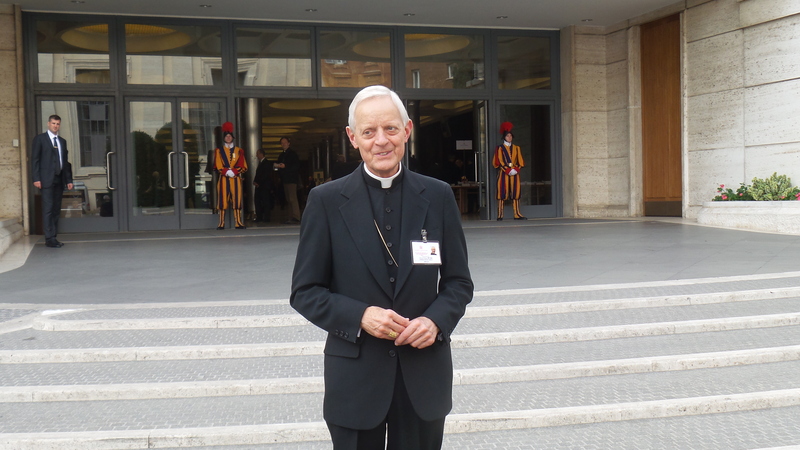 My guest this weekend on Vatican Insider is Cardinal Donald Wuerl, archbishop of Washington, D.C. We spoke outside the Paul VI Hall during the morning coffee break on Wednesday during the second and final week of the recent synod on the family. It is fascinating to hear him talk now, given that he spoke during the synod and the synod itself ended two weeks ago and a lot has been said since. Cardinal Wuerl was on the committee that wrote the Final Report of the synod, a document quite changed from the interim report that had been released on Monday, October 13, two days before we spoke in Rome. Translation issues from Italian to English on that interim report – which was just that, an interim report, a draft, not a final document – caused massive confusion that week on a number of hot button issues (like the pastoral ministry for homosexuals) among synod participants, the media and the faithful around the world. A communique published today by the Pontifical Council “Cor Unum” announced that the council secretary, Msgr. Giampietro Dal Toso is on his third and final day in Damascus, Syria where he has been attending the meeting of the assembly of Catholic bishops in Syria. Msgr. Dal Toso also met with various institutions, especially Catholic, that are currently involved in humanitarian aid activities in the country. Cor Unum, meaning “one heart,” is considered the Pope’s charity arm. In these meetings, special appreciation was expressed for the commitment of the Holy Father and the Holy See to supporting the Christian communities and the population as a whole, who suffer as a result of the conflict, and for encouraging dialogue and reconciliation among the various parties. Emphasis was also placed on the important role of Catholic aid organisms that serve and benefit all Syrians. However, said the communique, in the face of an ever-growing need, this assistance will have to be intensified in the future through the generous contribution of the international community. ANSA, the Italian news agency, in a report on Halloween and the celebrations of All Saints and All Souls on Saturday and Sunday, notes that, throughout Italy, the Catholic Church has taken pains to organize October 31 events in hopes of drawing youth away from the temptation of carving a pumpkin or attending a Halloween costume party. Alternative events, said the report, include all-night prayer vigils, Masses, and Christian rock concerts. “It’s OK to have a party if the children want one, but let us not forget All Saints’ Day and All Souls’ Day,” said the Catholic weekly, “Famiglia Cristiana” (Christian Family). “This kind of feast…does not belong to our Christian roots,” commented Bishop Domenico Sorrentino of Assisi. Halloween is not a traditional date on the Italian calendar but has been growing in popularity in recent years, with trick-or-treating becoming more common and pumpkin sales rising. ANSA says that Codacons, a consumer group, reports that some 10 million Italians celebrate Halloween each year, spending an estimated 300 million euros ($420 million). More than a million pumpkins are sold at this time and stores known for Carnevale costumes, now sell masks, costumes and accessories. One place in Italy has a much longer Halloween history. A small town in the southeastern region of Puglia, Orsara di Puglia, has been celebrating it for the past 1,000 years, says ANSA. According to local historians, the only real difference between the American tradition and the town’s version of Halloween is the date. Halloween, a secular take on All Hallows Eve, the night before All Saints Day, is traditionally celebrated on the night of October 31, but in Orsara di Puglia the pumpkins come out on the evening between November 1 (All Saints Day) and Nov 2 (All Souls Day). Hollowed-out and candle-lit pumpkins are placed outside homes on the evening of All Saints Day to keep away evil spirits and witches. Townsfolks also light huge bonfires in the streets so as to illuminate the path of souls on their way to Purgatory. Historians have traced Orsara’s tradition back to a short-lived 8th-century incursion by a Germanic people, the Longobards, who in more northern parts supplanted older civilisations and reigned as the Lombards. The November 1 solemnity of All Saints, and November 2 feast of All Souls were always holidays in the Vatican during the years I worked there and today, November 1, no matter what day of the week it falls on, is always a big holiday in Italy, When I was at the Vatican, John Paul II was Pope and we celebrated his baptismal name day, Karol (Charles), on November 4. That day was always a holiday because the Vatican and Roman Curia always celebrated a Pope’s name day. When the stars aligned and November 1 and 2 fell on a Friday and Saturday and November 4 on Monday, we had a four-day weekend. Thinking about those years as I did today, the vigil of All Saints Day, I remembered a column I wrote about this holiday the first year I began writing Joan’s Rome. Art Buchwald, a famous humorist and columnist wrote an annual column for the Washington Post about Thanksgiving. Even if you almost had it memorized from years of reading, you still enjoyed reading it every Thanksgiving. Today I present my (now annual) All Saints column in the hopes that you enjoy it, whether you were a Joan’s Rome fan in 2006 or have recently joined the team! I have checked some of the prices I quote in this story and have found – no surprise – that most of them have increased, some of them markedly, in the past three years. As I write this column, there is an almost unreal morning silence outside – unreal for Rome whose chaotic traffic, if nothing else, can cause untenable noise pollution. To enjoy silence, most Romans look forward to Sundays, holidays and the months of July and August when people go away on vacation. It is so quiet because today is a big holiday in Italy and the Vatican – November 1, the feast of All Saints. The Vatican also observes November 2 – All Souls Day – a commemoration that used to be an Italian holiday but has been removed from the calendar of public holidays. Not that that makes much difference to Italians who use any excuse to create what they call a “ponte,” a bridge to an extra long weekend. If November 1 falls on a Tuesday or Wednesday, for example, Italians will take off the days prior to that date and enjoy a really long “ponte” weekend. November 1 is such an important day for Italians that many newspapers publish special inserts on how to get to a city’s cemeteries, where to park cars, what shuttle buses are available within cemeteries, etc. Cemetery opening hours – usually longer in the October 29 to November 5 period – are posted, as are the hours and routes of the “C” busses (“C” for <i>cimitero</i> or cemetery). In Rome there are 12 cemeteries and each one has special rules and regulations and opening hours. The larger ones will also have free shuttles buses (because no cars will be allowed) to take people to the graves of loved ones. In Rome’s largest cemetery, Verano, 16 stops have been programmed for these buses. An estimated one million people are expected to visit Rome’s cemeteries in the weeklong period dedicated to the deceased. The city always makes a concerted effort at this time of year to clean cemeteries of trash, to repair walkways and even headstones and to do some serious gardening. Visitors too will clean tombs, bring fresh flowers and entire families will meet to mourn their dearly departed as well as to celebrate their lives. And then family members will usually all go out for lunch or dinner, sometimes even taking a picnic lunch along (though not for eating in the cemeteries – even though that is what the very first Christians did when they gathered at burial grounds or in the catacombs). Once a Rome daily even featured a survey on the cost of funerals, saying “there is some meager consolation for those in mourning in the capital of Rome because a funeral there costs the least” of all cities questioned for the survey. I don’t have the figures for 2014 but in recent years average funeral costs ran about 6,000-8,000 Euros ($7,500-10,000, adjusted for inflation), with cremation costing between 3,000-4,000 Euros. These prices are supposed to include a walnut coffin with zinc interior (except for cremation, of course), flowers, the burial and documents. However, say newspapers, the best bargain is still a funeral paid for by the city, as they cost several thousand Euros less. Churches worldwide usually have Sunday Mass schedules on November 1 as it is a Church precept that Catholics must attend Mass on All Saints Day. On November 1 it is tradition at the Vatican for Popes to celebrate Mass for the Solemnity of All Saint’s at the Campo Verano cemetery in Rome and, on the following day, November 2, All Souls Day, to lead a prayer service in the Vatican Grottoes for all deceased Popes. That is, in fact, what is on Pope Francis’ agenda this weekend. And, although these are predominantly religious celebrations, secularism has crept in. Masks and costumes, witches and pumpkins and orange and black color schemes have invaded Italy and those items and colors will be seen throughout the peninsula tonight as revelers celebrate All Hallows Eve. The price of flowers soars for about a week every year during this season. I learned a very hard lesson about Italian customs on this feast day the first year I was in Rome. It was the very end of October and I went to a private clinic to visit a friend who had just had serious surgery. I wanted to bring Lina an impressive bouquet of flowers to cheer her up but my budget did not allow for “impressive.” So I did the best I could. I bought about 8 or 10 chrysanthemums – because they were bigger flowers, they seemed more impressive as a bouquet. Surely just the thing to bring a smile to Lina’s face, I thought. Well, I knew the minute I walked into her hospital room that something was wrong. I saw a strange look on her face (and also on the face of a cousin visiting her, a priest), but never for a minute did I associate it with the flowers. We chatted and visited and faces seemed to brighten up, so I dismissed the first impression I had received that something was wrong. My wish for you, my readers, is that you have a blessed and prayerful All Saints Day and All Souls Day.